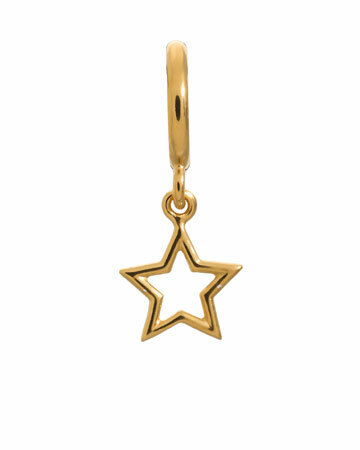 The stunning gold Star hanging charm from Endless Jewelry is a beautiful variation of the Star charm in silver. Endless Jewelry is a Jewellery brand for high-quality leather bracelets and sterling silver charms. Endless Bracelets are available in twelve different colours and three different lengths: single, double and triple wound. Endless Jewelry with Charms in three different colours (silver, gold and rose-gold) can easily be ordered in our online shop. In combination with suitable Charm Bracelets, Endless becomes a personal and individual piece of Jewellery. This item is available in stock. Please note, we are closed on a Sunday, so orders placed on this day will be processed the next working day. Orders placed after 11am on a Saturday will also be processed the next working day. Shopping at Les Harris Jewellers in the picturesque market town of Frodsham, Cheshire, you will find a wide range of Silver handmade and British Designer jewellery. Our contemporary collection includes well known brands such as Lovelinks, Hot Diamonds, Dower & Hall and individual handpicked pieces of jewellery from up and coming British designers such as Collette Waudby and Charmian Beaton. We also showcase a beautiful collection of gold and diamond set jewellery, timeless classics designed to be adored! If it is something more individual that you desire we offer a jewellery commission service, designing custom made jewellery especially for you; other services we offer include jewellery repairs, watch repairs, bead restringing and a jewellery cleaning service. We hope you enjoy browsing our lovely selection of earrings, rings, necklaces, bracelets and bangles, charm beads, charm bracelets and watches.